MOLLUSCA : NUDIBRANCHIA : Discodorididae SNAILS, SLUGS, ETC. Description: Adults may reach a length of up to 65mm. The body of this nudibranch is mottled with brown, orange or purple. There may be up to 12 stellate patches on the mantle that radiate from a central papilla, these patches are paler in colour than the rest of the dorsum and correspond to acid glands. The back of this animal is covered with numerous small tubercles. 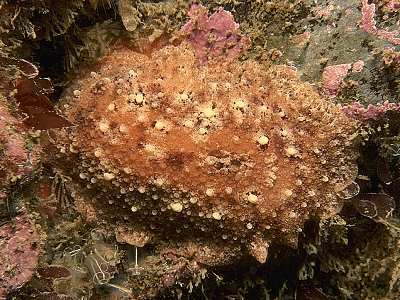 Habitat: Usually found in the shallow subtidal, it feeds on sponges such as Mycale rotalis. The spawn is a broad ribbon laid in a spiral with the upper edge neatly rippled or convoluted. Distribution: Locally common on the south and west coasts of the British Isles including the western isles of Scotland and the Isle of Man; and from Norway to the Mediterranean. Recently recorded from several sites on the North Sea coasts. Similar Species: In the past this species has been confused with Archidoris pseudoargus, however it can be readily distinguished by the presence of brown spots on the underside of the mantle. Long finger-like oral tentacles, not present in A. pseudoargus. Stellate shaped patches surrounding large tubercles on the mantle. Picton, B.E. & Morrow, C.C. (2016). Geitodoris planata (Alder & Hancock, 1846). [In] Encyclopedia of Marine Life of Britain and Ireland.